On a spring day in 1986, Pierre Matter died. Or, at least, that’s what a local newspaper mistakenly reported following the then-22-year-old’s motorcycle accident. Prior to this, Matter had been seeking his life’s path, which included quickly aborted studies in mathematics and theology. But awakening in his hospital bed, forced to rediscover himself due to amnesia, Matter was invigorated to revisit his passion for art. No stranger to creating illustrations and paintings, Matter’s post-accident artistic outlet took the form of a comic book. Titled Les Chevaux de Ladoga, this endeavor was ultimately a failure, one which forced the artist to explore more practical careers. After a string of jobs in the agricultural and construction trades, Matter eventually relocated to Luberon in the south of France, where he began creating stone bas-reliefs. Reawakening the artist within himself, this material and technique allowed Matter to return to visual narratives, though simplified ones that fit into a single sculptural panel. Satisfied with this new direction, Matter spent nearly a decade working in bas-reliefs, but the birth of his son spurred a transition into the metal medium he has since become recognized for. Working primarily in bronze, though frequently embellished with recycled and scrapped objects, Matter hammers, welds, and melts his fantastical forms into being. Citing Enki Bilal, David Lynch, H.R. Giger, Alejandro Jodorowsky, Salvador Dalí, and Jules Verne among his main influences, Matter’s works have increasingly revolved around an imaginary world populated by creatures that combine organic and mechanical aspects into one entity, a futurist’s speculation of what may yet be. 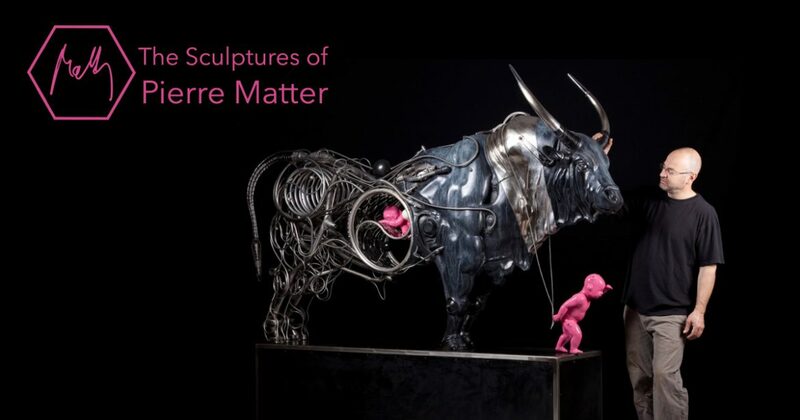 Discussion regarding Matter’s work typically centers around his biomechanical themes, his merging of the natural and the technological. Forging a dark future vision where evolution required the assistance of machines, Matter’s world is one where all creatures great and small have been transformed into multilayered hybrids. Challenging the viewer to consider how dependent modern society has become on technology, how it’s invaded every aspect of our existence, these strangely alluring sculptures reflect a robotic revolution that we secretly fear is inevitably coming. But perhaps more telling than his mechanical-animal creations is his frequent juxtaposition of them with baby-like forms. Never fully human, even these infants are augmented by robotic aspects, conceptually likening them to Astro Boy. Seeming more android in nature when depicted in chrome, it is their flamboyantly flesh-like pink iterations that convey their true significance: these baby characters are us. They represent mankind. And while their apparent age emphasizes the fragility of the human form, their stances and placement relay man’s self-proclaimed position at the top of the food chain. Using animals as beasts of burden and even frightening the most dangerous predators, Matter’s future musings appear to attest a universally held truth: the more things change, the more they stay the same. As of this writing, Pierre Matter currently has works displayed as part of the Small Works group showcase at New York City’s AFA Gallery and was recently the subject of a solo exhibition, Beyond Boundaries, at Singapore’s Opera Gallery.